Childbirth injury to the ligaments and muscles that support the walls of the bagina. Heavy weight lifting resulting in increased intra-abdominal pressure due to straining. Racial factors (Caucasian and Asians are more commonly affected than African American people). Endometriosis is the growth of tissue that is normally found in the lining of the uterus (endometrium) in a location outside of the uterine cavity. 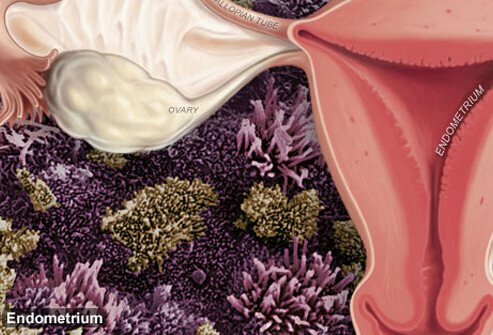 It can occur on the ovaries, surface of the uterus, on the intestine, or on or in other organs. With the changing hormone levels during the menstrual cycle, the tissue may grow and break down, leading to pain and eventual scar formation. Over 5.5 million American women have symptoms of endometriosis. Vaginal yeast infections are caused by bacteria.